Complete the educational requirements for your license (will vary based on license). Successfully pass your state and/or national exams (must be dated within twelve months of your application). Fill out your Real Estate License application. Stop in any convenientto Fingerprinting Express location [insert location link] or another approved vendor to have your fingerprints done. Nevada residents should submit fingerprints via Livescan, unless you are applying for a Community Manager License then you must complete fingerprint cards. (Fingerprinting Express has the required FD258 fingerprint cards in stock.) You can then submit two fingerprint cards or your Livescan Fingerprint Verification Form signed and stamped by uswith your application or provide a verification form from your fingerprint vendor stating that you had your fingerprints taken using Livescan electronic submission. Submit your original completed application – do not submit copies. They will be rejected. Make sure you submit your Real Estate application within 90 days of being fingerprinted. Over 91 days, NRED will make you get fingerprinted again at your own expense. Note: Requirements will vary based on the type of license you are applying for. Click here for complete details of the licenses and requirements for each as well as the renewal criteria. We are the fingerprinting experts so you don’t have to be! Stop in to one of our four clean, modern facilities and our technicians will have your fingerprints done in minutes! 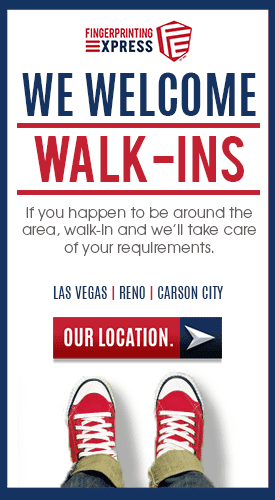 Book an appointment online or walk in at a time most convenient for you during open business hours. Be sure to bring a valid government-issued I.D. If you have any questions on what to bring, give us a call at 800-919-0227. Q: What will my fingerprints for the Nevada Real Estate Division be used for? A: Your fingerprints will be used to check your criminal history with the state of Nevada and the FBI. Q: For how long will my fingerprint cards be accepted after I have them completed? A: Your prints are good if they have been taken within ninety days of licensing application submission. If older than ninety days, you may be asked to complete a fingerprint background check again.